President Barack Obama has met exiled Tibetan spiritual leader the Dalai Lama at the White House, US officials say. 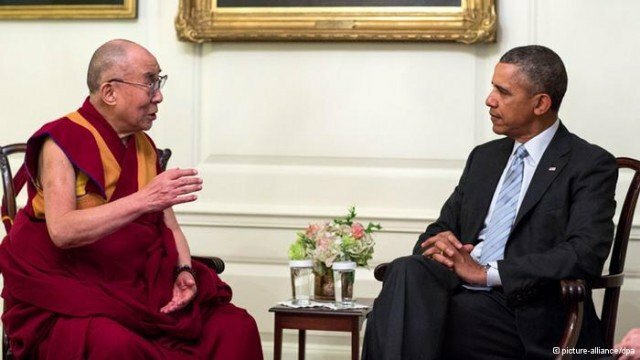 Barack Obma vowed “strong support” for the protection of Tibetans’ human rights in China during the encounter with the Dalai Lama. China had urged the US to cancel the meeting, saying it would “seriously impair China-US relations”. Beijing described the Dalai Lama as a separatist, while the spiritual leader said he only advocates greater autonomy for Tibet, not independence. During their meeting in the White House Map Room, Barack Obama and the Dalai Lama reportedly said they hoped talks would resume between Beijing and the Tibetan spiritual leader’s representatives. The two men last met in 2011, in talks that angered China. Tibet is governed as an autonomous region in China. China has been widely accused of repressing political and religious freedoms in Tibet. Beijing rejects this and says economic development has improved Tibetans’ lives. China’s response to the meeting was swift, with the country’s Vice-Foreign Minister Zhang Yesui summoning US charge d’affaires Daniel Kritenbrink to protest against the encounter. “China expresses strong indignation and firm opposition,” Zhang Yesui said, according to the Xinhua news agency. “The Tibetan issue is the domestic affair of China, and the United States bears no right to interfere,” he added. Caitlin Hayden, a spokeswoman for the National Security Council, earlier said President Barack Obama met the Dalai Lama “in his capacity as an internationally respected religious and cultural leader”. “We do not support Tibetan independence,” she said, adding that the US “strongly supports human rights and religious freedom in China. In recent years more than 110 ethnic Tibetans – mostly young monks and nuns living in areas outside Tibet – have set themselves on fire in apparent protest against Beijing’s rule. China’s government accuses the Dalai Lama of orchestrating the protests, a charge he strongly rejects. The Dalai Lama fled to India in 1959, after Chinese troops crushed an attempted uprising in Tibet.